There is a chill that signals autumn’s end. Tonight the cold, hard hand of killing frost will descend. Tomorrow the garden will be stiff and silent. And so I’m in the garden picking roses. Every single one. A week ago I would have left a bud to bloom another day. Not this afternoon. I pick them all. They are full and flourishing, unaware of impending doom. Soon my hands are full of extravagant beauty - heavy heads of lacy petals bowing on slender stems; bright red, rosy mauve, palest pink and creamy white. A scent of musky sweetness wafts in the cool air. I bring them in and place them in a pitcher. There’s no arranging, I just stuff them in. I am astounded. No summer bouquet was quite so lovely. Perhaps I have never seen such a beautiful display. I want to argue, to halt the approaching winter. This is not what anyone wanted. She has a million reasons to live and she’s much too young. But, she has fought hard; has tried everything, gone everywhere. And now it’s time to stop. I blink back tears and shiver. Winter is coming too soon to this rose of poignant beauty glowing in autumn’s bitter wind, all the more lovely because we cannot keep her long. Moments later, I walk without knocking into the home of my old friend, Lois. I know where to find her and she cannot come to me. Her world is the four walls of her bedroom. She has not left her home in quite some time, barely even her bed. Her welcoming smile is tender and her voice is soft and gentle. I am grateful that I do not hear in her voice any of the crushing, excruciating pain that has kept me from visiting in recent weeks; although I know that she is never completely free of pain. But she is weak, so very weak. The room is pleasant and toasty; still there is the chill of approaching winter. 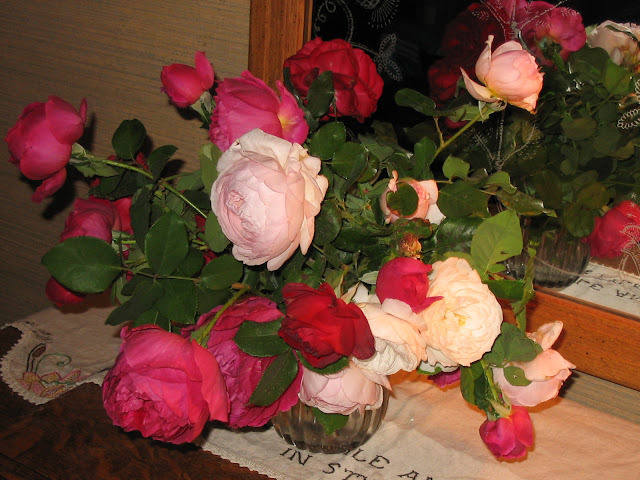 I’ve brought a few roses from my bouquet and I place them on the microwave that sits on her dresser. I warm her meal, but she does not sit to eat; instead she leans on her side and takes a bite. A conversation can exhaust her and so I try to wait quietly, let her tell me what she needs to. I want to tell her that she’ll get better. But I can’t. She has been disappointed many, many times. My visit is brief. I pause to pray with her before I leave. She stops me. A prayer request? Of course. “Pray for courage for me. I’m not getting any stronger.” She is a delicate, fragile rose blooming in this secret garden; whipped by harsh wind, yet there is the lovely scent of peace and acceptance. When I return to my home, I am struck again by the loveliness of the bouquet and the lavishness of a multitude of flowers. A spicy, musky scent fills the room mingling with the grief I feel. It has been a sad day. I breathe deeply and stand still and simply look, trying to memorize the beauty. It will not last long. Already a petal has fallen from a heavy, nodding flower. Two weeks latter I attend Carol’s funeral. The November weather is unseasonably warm. When I stop to see Lois she says, “Oh, I’m so happy for her.” People with the hope of heaven can talk like that, but her bright smile does not hide the longing, perhaps even envy that I hear in her voice. In my garden, I find a rose blooming. How did I miss it when I was picking flowers? How did it escape the freeze? Some of the petals around the edges are slightly shriveled, darkened by the cold wind. It dances high on the bush, nodding in the day’s warmth. I pull it down and breathe deeply. Yes, there is a faint scent. Written in 2003. We remember fondly the vibrant life of Carol Heinlein. Lois Taylor's condition remains largely unchanged, although I believe changes of medication have been helpful. She appreciates all prayer support. Bev...I just love your writing. Every single one of your posts makes me think. Thanks for sharing. I will continue to read.